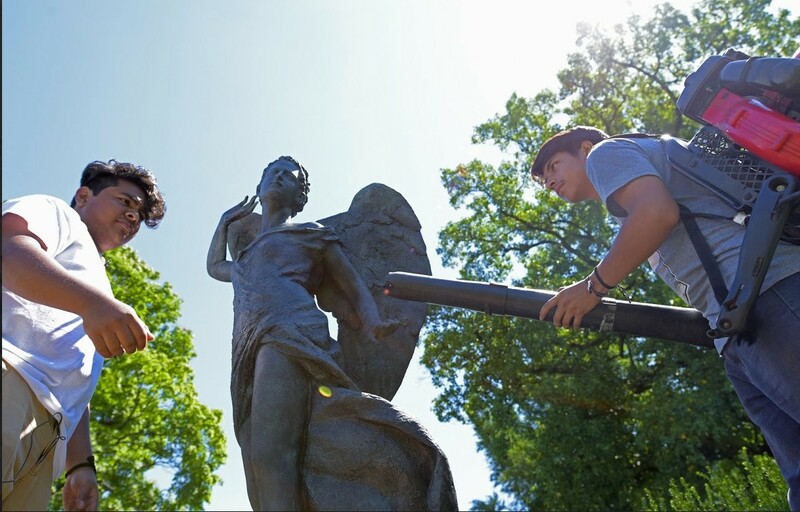 Williamsburg High School of Architecture students and volunteers Arturo Juarez (left) and Alexis Rojo dry “Angel of Music” with a leaf blower. Proof that France’s generosity to the U.S. didn’t end with independence or the Statue of Liberty was found in Brooklyn’s historic Green-Wood Cemetery this past Wednesday when volunteers from the renowned preservationist organization Union REMPART braved a mid-summer sun to clean and treat the “Angel of Music,” a striking bronze sculpture that marks the tomb of Louis Moreau Gottschalk, the U.S.’s first internationally famous composer and one of Green-Wood’s most venerable interments. While the preservationists took a short break, Arturo Juarez and Alexis Rojo, students from Williamsburg High School of Architecture — partnered with Preservation Volunteers — passed high-pressure sprayers all over the Angel. To read the full story, click here or see below.